since he’s 8 years old. In 2009, after obtaining his classical music prize at the Conservatoire de Reims (France), he went on tour with « La bande Original ». He accompanied artists such as Oxmo Puccino, Olivia Ruiz, Amadou and Mariam, Vincent Ségal, Cyril Atef. After this enriching experience he decided to learn the composition and jazz arrangement with of Manu Pékar and began taking improvisation lessons with Rick Margitza and Dave Liebman. 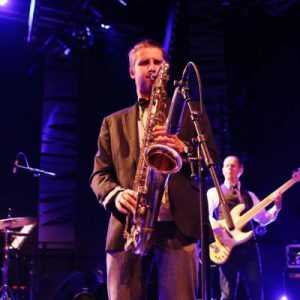 At the age of 20, he joined the Jazz Academy at La Haute Ecole de Jazz in Lausanne where he developed his musical universe with jazzmen like Robert Bonisolo, Matthieu Michel, Mark Turner, Emil Spanyi, Vinz Vonlanhten and Bänz Oester. In June 2015 he obtained his master and began a second master in pedagogy. Open Air, Gurten festival, Belfort Eurokéennes, Heitere Open Air, Montreux Jazz festival, Cully Jazz festival, Reims Sunnyside Festival, Cabaret Vert..). We can find him in formations such as Cauliflower, C.OT.I (Hip-Hop), Bastian Baker (pop), Danitsa (neo-soul), Sons of Africa (Reggae) and others.